This article has been written with kind permission from Helen and Dave Dunwoody, and is a poignant illustration of how all of those participants in the Marlow Red Kite Ride are helping others through the Sportive’s charitable donations. On the face of it the Dunwoody family, from Iver Heath in Buckinghamshire, are an ordinary hard working happy and close knit family. But 10 years ago, in August 2005, their world was turned upside down when three year-old Niamh Dunwoody was rushed to hospital having been diagnosed with a brain tumour. “We knew that something wasn’t right beforehand,” said Niamh’s mother, Helen. “it turned out that the tumour was the size of a golf ball.” “We recognised that she had some problems with her balance. She just kept bumping into things,” added Dave, Niamh’s father. “Initially it was mis-diagnosed and it wasn’t until she had a cat scan that the tumour was revealed. Suddenly Niamh was taken straight to the John Radcliffe Hospital in Oxford for surgery,” said Helen. The surgery removed the initial tumour but Niamh had lost her speech and her ability to walk. She would have to learn critical life skills all over again. Four sessions of chemotherapy and 31 sessions of radiotherapy followed over a six month period, in order to stop the cancer spreading. Worse was to follow. The treatment had severely reduced her immune system so she had to be kept away from all possible infections. But on one of the visits to hospital Niamh contracted an infection which left her very poorly. “I clearly remember. It was near Christmas and it was a very difficult time,” Helen added. But it was to be the turning point in her recovery, a recovery that is ongoing as she continues to fight the effects of such a trauma at a young age. 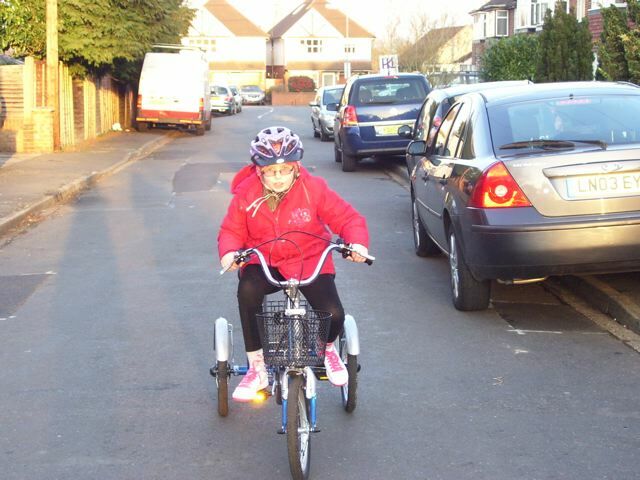 Niamh is now 13 and a happy and confident child, but due to the area of the tumour she still has coordination and balance problems and goes to a special needs school in nearby Beaconsfield. “She never complains. She just accepts everything. She never asks why she doesn’t have any hair – in fact she wants to become a hairdresser! “added Helen. Recovery sometimes has seemed painfully slow but one of the big steps Niamh took was when she was nine and received a gift from the charity Cyclists Fighting Cancer. The gift was a specially adapted tricycle. Niamh loved it and it suddenly became a gift of a new found freedom. “We couldn’t believe it when we got the call. Mike from the charity came down with it. It was so special to see our little child going up and down the road on her first bike, said Helen. Niamh eventually outgrew her beloved trike. 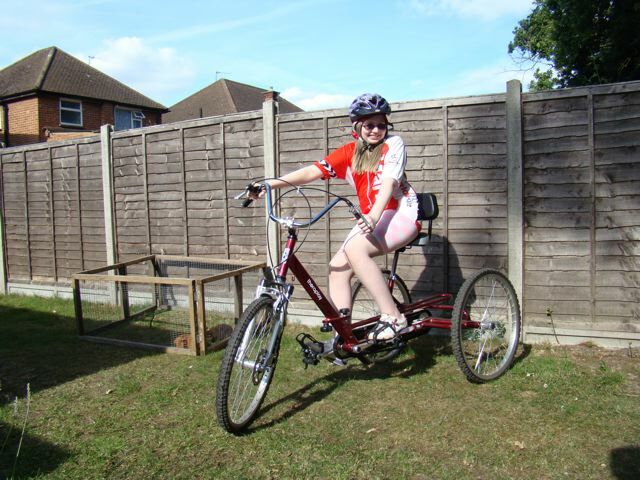 But due to the efforts of all those who entered last year’s Marlow Red Kite Ride, earlier this year she was able to receive a new larger trike from Cyclists Fighting Cancer. It has allowed the family to plan for summer trips to parks and quieter roads where Niamh can continue to build her strength and fitness.